Best Seller! Great Results with this cooler! Extremely lightweight and super breathable, this cooler is made from a 3D air mesh fabric with a smooth outer. 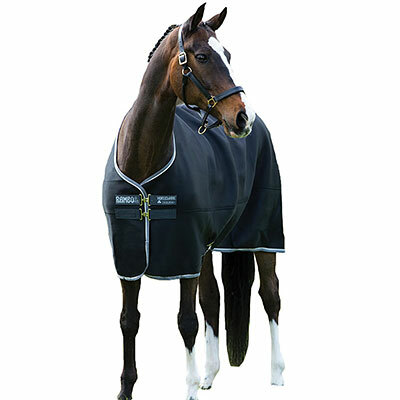 Popular in hot weather when you want your horse to dry quickly, particularly the silver reflective fabric which is a great choice on hot summer days. Our riders used it during our winters when it's a hardship to dry a lathered horse before you blanket and turnout. Yet, it's even better on hot days to prevent over heating. Great choice whatever the conditions, this cooler dries quickly. Best cooler I have ever used! The Rambo Airmax Cooler is by far the best cooler I have ever used. Whether it's the middle of summer or the dead of winter this cooler does its job. It dries my TB gelding in very little time so he can go back to pasture, but won't collect sawdust if he lays down in his stall with it on. I would recommend to anyone!